Bright Seasonal Rental / Vacation Getaway !!! 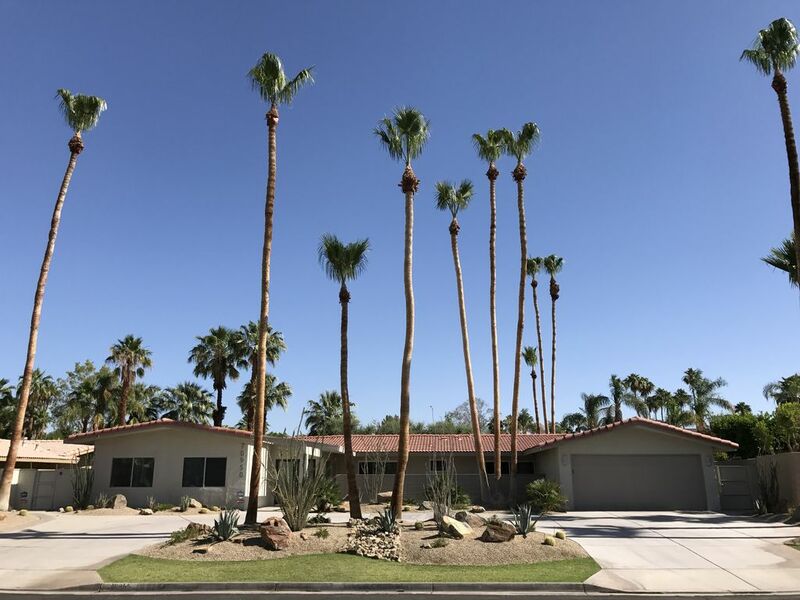 Located in the heart of Rancho Mirage, this historic home was originally built by Frank Sinatra for his daughter Nancy Sinatra and later owned by comedian Pat Henry during the two decades he opened for Frank at Caesar’s Palace Hotel in Las Vegas. According to Pat’s daughter, this home hosted many wild parties and rejuvenating vacations for famous celebrities during the 60’s and 70’s. Those days are gone, but the home that provided the perfect setting for entertainment and relaxation is still here and now available for you to enjoy with your family and friends. Decorated to emphasize its open floor plan, this bright and airy ranch-style home has been completely updated with stainless steel appliances, granite countertops, sleek cabinets, contemporary fixtures, travertine floors, stylish carpets, energy efficient windows, and modern furnishing throughout. With three bedrooms, the home is naturally set up to sleep six, but could accommodate up to ten (with young children) with a double bed futon and double air mattress. Given this flexibility, the home is great for entertaining, ideal for week-long or weekend vacations for two to three small families or a season rental for singles or couples that expect regular guests. The gourmet kitchen, with its open access to the adjacent living room and dining room, is the center point of the home. Floor to ceiling windows provide excellent views of the gorgeous backyard and pool. Exit to the backyard to take a swim in the salt water pool, soak in the spa, play games on the large green lawn, pick fruit from the citrus trees, start a BBQ on the gas grill / wood smoker or hang out under the umbrella or misters. Move to the home theater room for high definition television, movies, music, and games with the ceiling-mounted projector and enormous wall-mounted screen. Make your way to the spacious garage to enjoy a game of ping pong or darts or to head out on bike ride or walk. At the end of the day, retire to the master bedroom or one of the guest bedrooms, each featuring private bathroom with shower and private patio with garden. Great place to stay in the desert. Great home, great location! Host was easily accessible for whatever we needed and the home was in a perfect location for us. Beautiful area and would definitely stay again. We stayed in Feb 2019 in Rancho Mirage for the second year at this property. We enjoyed the very large backyard with a pool and a spa tub, although it was much too cold this year to consider heating/using the pool. The entertainment room with the projection TV was great for watching movies, sporting events and the Oscars. The open floor plan is very inviting and comfortable. There is a coffee pot and a Kreurig, the kitchen has many pots and pans, a blender, a rice cooker, and also many glasses and plates, suitable for entertaining both inside and outside. The kitchen could benefit from a few additional tools if you cook quite often. The house is very clean and comfortable. The house is in a very secure feeling neighborhood which is very walkable. The host, Jacques, is very approachable and responsive. When we had an issue with the home theatre system, he came personally in just a couple days to remedy it and even added a requested sports channel. I would highly recommend this property and especially the owner, and we would not hesitate to stay there again depending on our future plans. Thank you for the positive comments. We hope that you come back again next year! Clean, quiet, and all the amenities! Thanks for the great review! Glad that you enjoyed your stay and we hope to have you back sometime soon! The place is simply AMAZING!!!! The house and backyard were incredibly maintained, a really great layout that was very inviting and comfortable. We enjoyed spending family time in the movie room, pool, jacuzzi, fire pit and BBQ. There was even a ping pong table in the garage. So much fun love Rancho Marine and can't wait to come back again soon!!! Thank you for the positive feedback! We hope that you come back soon! Jacques home is located in a very pretty, serene and sophisticated neighbourhood. We enjoyed taking strolls and observing the interesting architecture of homes up and down the street. The house is spacious, informal and very comfortable . We felt right at home as soon as we entered the front door. Highlights: (1) the amazing back yard w/ pool, hot tub, bbq and fire pit (2) the theatre room with HD tv projector and (3) each bedroom had an ensuite bathroom and (4) our very helpful host, Jacques. Overall, we really enjoyed our stay and would definitely rent this place again in the future. Thanks Ann for the wonderful review! We look forward to seeing you and your lovely family again! We stayed in Feb/March 2018 in Rancho Mirage, and this property was outstanding. We enjoyed the very large backyard with a pool and a spa tub. The entertainment room with the projection TV was great for watching the Olympics and other sporting events. The open floor plan is very inviting and comfortable. There is a coffee pot and a Kreurig, the latter was nice when we had guests. The kitchen has many pots and pans, a blender, and also many glasses and plates, suitable for entertaining. The house is well stocked with towels and linens and very clean. The house is in a very nice and very secure feeling neighborhood which is very walkable. The host, Jacques, was very approachable and responsive. When we had an issue with the spa tub, he had a pool service employee there within an hour. I would highly recommend this property and owner, and we would not hesitate to stay there again in the future. Thank you for the kind words! Glad that you enjoyed your stay! Please contact owner for prorated rates for shorter stays and discounted rates for longer stays.